Close to 50 percent of the rainforest in Cameroon has been subjected to forest exploitation in the last 3 decades. As the country seeks to further develop sustainably, there is an urgent need to protect and effectively manage the remaining areas of rich forests (TRIDOM & Ngoyla Mintom forest blocks, for example) to maintain their integrity. 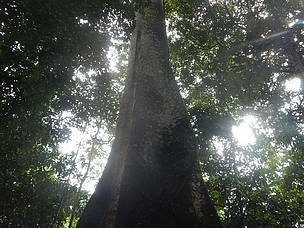 WWF Cameroon’s efforts in sustainable forest management in Cameroon aim to look beyond protected areas (PAs) and ensure that the impacts of activities at its peripheral zones do not affect the parks and the overall forest ecosystem of the region. Our strategy consists of mainstreaming sustainable forest management standards in all priority landscapes through three key interventions, namely Voluntary Partnership Agreement/Forestry Law Enforcement, Governance and Trade (VPA/FLEGT), Best Management Practices and Certification, and REDD/Climate Change. 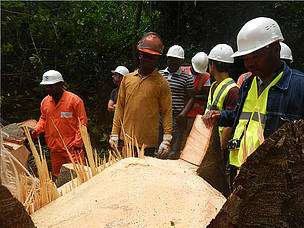 The VPA/FLEGT initiative focuses on non-permanent forest domain and aims to reduce illegal artisanal logging. Best Management Practices and Certification and REDD/Climate Change are implemented in the permanent forest domain as well as in the non-permanent forest areas, with limitation to community forests in the non-permanent domain. In order to reduce unsustainable logging, the objective is to increase the forest area under certification and/or under best forest management practices.